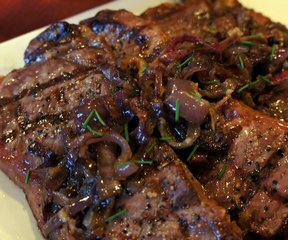 Thinly sliced onions caramelized with oil and garlic are the perfect addition to your grilled steaks. Make sure you make enough as the onions really cook down. 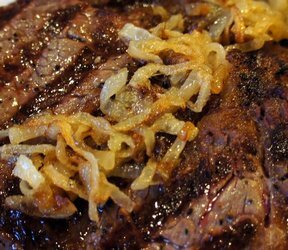 This is a dish to be watched because you do not want them to burn as they caramelize. 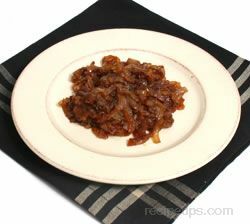 Watch the heat and keep stirring and you will be rewarded with a heavenly dish of sweet caramelized onions. Heat oil in frying pan over medium heat. Add onions and all the remaining ingredients, lowering heat if needed. Cook onions until they turn golden brown stirring often, approximately 20 minutes. "Since only 2 of us eat onions, I only used 1 onion...I should have cooked all 4 since we were fighting over the last bits! Delicious. I may have found a new favorite with my steaks over mushrooms."